Add Chickpea Flour, Black Pepper, Garlic Powder, Flax Meal, Smoked Paprika and 1/2 of Veggie Broth in a bowl and mix well. Add in Veggie Broth till you get a lump free batter that is thinner than pancake batter. Slice Yellow Onion and divide into rings. 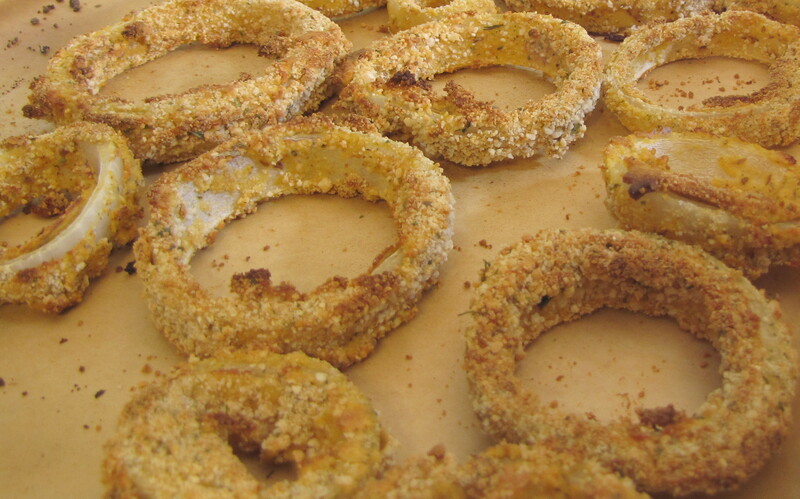 Dip rings in batter and coat with Panko Bread Crumbs. Place on parchment paper covered pan and bake for 25 minutes turning midway thru cooking. Turn on broiler for 1 minute or so to give rings that perfect browning. Serve.